What Foods Are High in Arachidonic Acid? Fat found in the diet is not all the same. Some types of fat can have detrimental effects on your health, while other fats when consumed in moderation help to reduce your risk of disease. Arachidonic acid is classified as an unsaturated fatty acid and is essential to the human body for healthy brain functioning and normal growth and development. The fatty acid is mostly found in the glandular organs, brain and liver of animals. In the 2005-2006 National Health and Nutrition Examination Survey, or NHANES, chicken and chicken-mixed dishes contributed the most to arachidonic acid intake in America. A 1-cup serving of a roasted chicken broiler contains 0.154 gram of arachidonic acid. 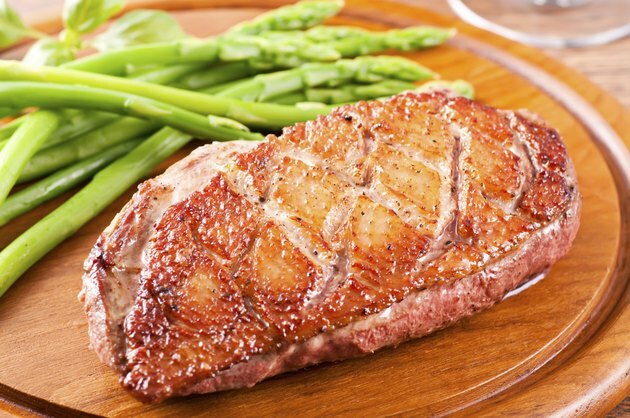 Duck contains the highest level of arachidonic acid among lean meats, according to a study conducted on dietary arachidonic acid among meat fat. Fish is best known for being a rich source of omega-3 fatty acids, which are also essential for a healthy body. But fish also contains arachidonic acid, classified as an omega-6 fatty acid. For example, a 3-ounce serving of Atlantic or Pacific halibut contains 0.002 gram. Wild Atlantic salmon contains a little more with 0.291 gram per 3-ounce serving. NHANES found that fish and fish products contributed around 5.8 percent of the total intake of arachidonic acid in America. One large hard-boiled egg contains 0.074 gram of arachidonic acid. Eggs were found to be the second largest contributor to arachidonic intake among American, according to NHANES. If you have high cholesterol or are at risk for the condition, consume eggs in moderation. While eggs contain essential nutrients your body needs, one large hard-boiled egg contributes 186 milligrams of cholesterol to your diet. While beef and beef products are the third top contributor of arachidonic acid to the American diet, according to NHANES, they contain lower levels of arachidonic acid when compared to white meats. Dark meats including beef and lamb are higher in omega-3 fatty acids but still contain arachidonic acid. A 3-ounce serving of beef roast contains 0.042 gram of arachidonic acid.